Interested persons are invited to futher contribute to this thread and the WikiSki article. I'm too lazy to check, were the earlier topic/photos archived? There has been some great input and photos over the years on the ol' chairlift. Fascinating. Part of the lift is currently work theme park somewhere near the cost south of Sydney. I forgotten where it was, but I will have a look latter. Jamberoo grass ski park. Has been there for 20+ years. I love this annual thread - tried that Jamberoo grass skiing way back in our bi-centennial year, crickey it can hurt! Jamberoo recreation park- unfortunately they got rid of grass skiing some years ago. There is a picture frame up on the wall with info regarding the origins of the lift. I find it fascinating to thing how long it may have been, does anyone know? I also picked up somewhere that when there was that major snow season it was getting buried, they were using tnt to try to free it up, but the snow would land back in the same place. I remember when the Jamberoo lift opened I think it was late 70s. In the early 80s I went to a grass skiing world championship there with european grass skiers getting into it. How far away from each other are they ? was it a chair lift or gondala ? I remember seeing a photo of the chairs frozen at an angle due to the wind, correct me if I am wrong, I think the chairs had a few steel panels and a roof(rounded bunker style) but was still open to the elements. Didn't somebody die on this chair when it stopped & they were left out there? Or did that turn out to be an urban myth? Hey. Thanks for the pic. Apparently you can still see traces of where this left went up and over from the Thredbo valley on a guided walk ?? Also - was there not one way back in 50's or 60's that burnt down withe the original CP chalet? Someone fill me in on the facts. The buiding of the lift commenced in 1963 and was completed in 64,it was built by Transfield on behalf of Kosciusko Chalet who were then owned by Broken Hill Holdings.The project reportatly cost 1,200,000 pounds. It ran during the 64 & 65 season before going into receivership. I was taken by my dad in 64' for a couple of day trips. From what I remember it was essentially two seperate lifts, that may be just my memory though, the second lift which terminated at Charlotte Pass hardly ever ran due to the high wind problems. Also there were problems with snow banking up on some of the towers.They may have been a little unlucky in opening the project in one of the biggest winters on record, not only large snow falls but apparently 64'was also a particularly windy season. The lift had brightly coloured fiberglass canopies that you pulled down for protection against the wind, there was window in the middle so you could see where you were going. The whole thing was pretty dicey in bad weather, once or twice the chairs came of the pullies and down they went passengers and all.That was not that unusual around this time, Thredbo also had similar problems with losing passengers when the chairs jumped the pullies just abovethe old Kareela station. It was advertised as the longest chairlift in the world, but that claim was not widly accepted, at least by the old blokes in our club. The lift had 50 towers, 8 stations and stretched over 5.5 kilometers. The skiing between the stations was as I recall a series of shallow bowls much as you see in the photo above. The top station at Charlotte's was sold off in the winter of 79, it was lot 18. For thoses of you who know Charlotte's it's about4 chalets up from the ticket office. OK Here it comes for its annual outing. UMMMM. I am a little confused. I never saw the chair in operation at CP. I assumed it came in over the back of KAC somewhere, but from the picture it seems to be coming from the direction of the bottom of the triple chair. Does anyone know the line the lift took into Charlotte Pass? Say looking up the mountain from the balcony of KAC. Headed straight up Mt Stiwell, across Trapyard creek valley and down the northernmost 'Twin Valley' to the current Ranger Station just down the road from thredbo. Its actually marked on the old 1:50000 kosi topo. The "cell block" at CP (now staff accom) was the bottom station so the lift line was almost perpendicular to the present chair at CP. So at CP the lift ran between the KAC & the bottom station of the Kangaroo ridge chair. is this real or is this like a "the fish was this big" story? Thanks for that i have often wondered where it was. The cell block ehh, makes sense the shape of the building, often wondered why it was built there over the stream. One of life's little mysteries solved. This photo shows the section across Trapyard Creek to Mt Stiwell (where the lift station is). The steep area to the left of the lift station is the Blue Lake chutes, which are a considerable distance from the chair but look close due to the zoom of the photograph. Charlottes is tucked down below the visable lift station. Awww man! That lift looks like it really gave you alot of slope that you could cover. Was the lift for skiing the area below it, or merely a method of transport?? What was the ski-patrol situation like in those days?? Was it closed due to the advent of ridiculous civil litigation?? Are there any websites with information about this? Why was it closed? Would they build it again later in the future? i'm fasinated by this thread! The Stillwell Restaurant was built as the highest point on the Thredbo Valley to Charlottes Path chair lift in 1964-65. The operation closed when a person came off the end of the chairlift dead from exposure. At the time, it was the longest chairlift in the world. The hut was destroyed by the elements in 1970 and later abandoned. A hut or shed nearby, albeit with a damaged roof, would make an excellent shelter hut, with minor restoration. The operation closed when a person came off the end of the chairlift dead from exposure. So it's true then? I have heard this story a number of times but never seen any evidence. You could still drive to the base of the Kosci knoll / hill - to that flat bit before winding around and up. Glad that is gone! This thread is definitely worth archiving when discussion is complete - Truly fascinating. Could you/or can you still see the old towers from the road to thredbo? are the fiberglass canopies in roho's picture above the chairs on the Charlottes side because I seem to remember the chairs (from another photo on a previous thread) on the thredbo side being different to that? or did they modify them due to the death? Well....... you see it goes like this. Gather round the fire while I tell you some tales abot the ol' chair lift. The fibregalss canopies were specified for the lift (in fact the whole chair lift was installed) without taking the prevailing winds into account. Some days the chairs were blown perpendicular to the ground & others they were blown right off. The operators tried all kinds of wierd stuff to minimise the windage including cutting big holes in the fibreglass. Of course nothing could solve the problem & the whole chair was shut down & later dismantled. There are no lift towers there at all now. Good Grief never seen a chair at that angle before, would not be much fun being inside that. Empty chairs were seen to blow in a 360 arc in strong winds, causing chaos to the cable and sheaves. I am still confused as to where the bottom station was in CP. I have found a plan of CP dated 10.11.76 that shows Lot 18,as the origional bottom station.The position is up near Stillwell lodge, not the 'Cell Block' Sorry I don't have a scanner so I can't post it . was the wind really that bad all the time? i dont know ive never skied thredbo or charlottes. help me out with the geography - where was the chairlift station in thredders, and what direction did it travel to get to CP? I've skiied both, but my geography of the whole area isn't great (actually, it pretty much doesn't exist). You can see in the design that wind was not really thought about. It went from near Ngarigo , you can still see the alignment in the canopy of the trees and it's pretty clear in the aerial photographs. this is probably one of the most comprehensive threads on this reoccuring topic we've had, request for knowledge bank or archive move at a laster date please. Especially if someone can futureproof the image hosting. How long did the ride take? Enough to make a difference. Plus, the drifting of snow across the top, between Stillwell and the start of Twin Valleys... was immense. Drifts were covering the towers, sometimes. And the biggest bit of bad luck.. 64 and 65 were some of the biggest snow years - ever!... the first two years of operation. Burying the lift, too many times, too many rescues. KMB. The Thredbo side. You can just make out the old lift line in the bakground to the rhs of the (now) rangers station. Some Twin Valleys trivia... where Pandas map comes from. Early 80s Australian ski book. The line on th e right hand side of the diagram is the lift line. That's a corker of an article..
Leatherbarrel Creek!!!!.... who were they kidding. 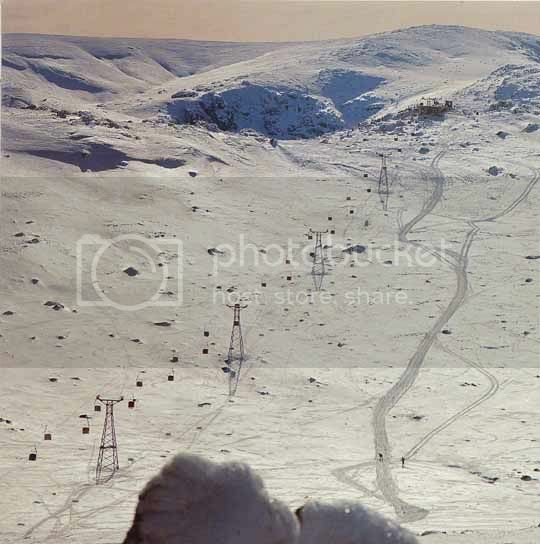 and wait, here's my collage of the lift line.. Thredbo valley to CP. and some whimsy about our mountains.. the picture is the Kosciuszko Cornice. ..
Barbara Cameron-Smith obviously needs to do a bit of research if she thinks that Mt Kosciusko is only 1600 metres. It (Kosi) has grown up since then.